"It can be down right abundant in the Huachuca Mountains of SE Arizona in early August." Southwestern U.S., south through Central America. Holland (1903) reports this insect as "fairly common in southern California, New Mexico, and Arizona." Texas: Davis Mountains, Jeff Davis Co., Guadalupe Mountains, Culberson Co.
Plus one sight record from Concan, Uvalde County. 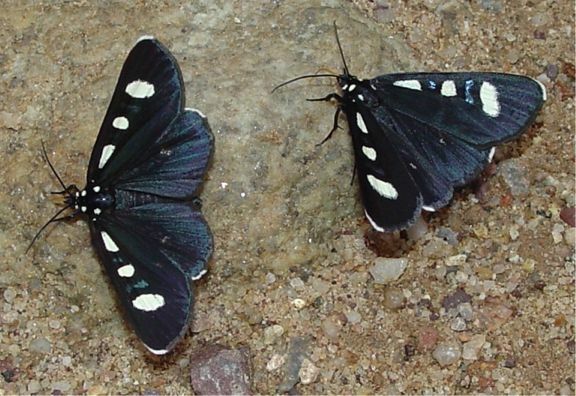 Flight Period: This diurnal moth flies from late July to October. Similar Species: There are four species of Alypiodes, of those, only A. geronimo also occurs in the U.S. (Arizona). Hampson, G.F. 1901. Catalogue of the Arctiadae (Arctianae) and Agaristidae in the collection of the British Museum (Natural History) Catalogue of the Lepidoptera Phalaenae in the British Museum, 3: xix + 690 pp. Knudson, E. & C. Bordelon. 2003. Checklist of Guadalupe Mountains National Park, Publication No. 4. Texas Lepidoptera Survey, Houston. (treats 1300 species, 12 color plates). Knudson, E. & C. Bordelon. 2003. Checklist of Davis Mountains, TX, Publication No. 7. Texas Lepidoptera Survey, Houston. (treats 1100 species, 10 color plates).